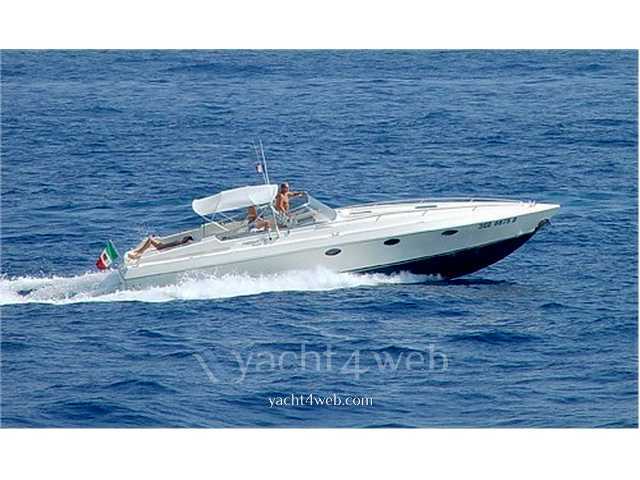 Italian flag Beam 3, 71m-17, 20tonn 0, 80 m Draft-2 double cabins – S.l. Dinette with table converts into a bed of a square-1 bathroom with shower and bidet. White hull-white-gray Upholstery Interior carpentry cockpit with internal dashboard area-large sundeck at the bow-stern Ramp 2 Caterpillar engines 3208 FINGERS 2x375cv-engine hours approximately 750 shaft-full engine Instrumentation Line-separator filters for diesel-generator-fuel Tanks 600 l 12/180 l-Water Plant: 220volts-Batteries and Battery Chargers for motor services-Boiler-automatic electric bilge pumps-2 Fridge (one on deck and one below deck)-kitchen-Microwave-Radio stereo CD-clock , Barometer, hygrometer-stainless-davits aft sundeck cushions-Catwalk-Scale bathroom-shower sump-electric Windlass – yet – chain (100 m)-mooring ropes-fenders.